Are processed foods to blame for the sharp rise in obesity? This is a question I’ve encountered from many of my readers, so I thought I’d start out by shedding light on what additives are commonly found in processed foods, before discussing the link between fast food and obesity. 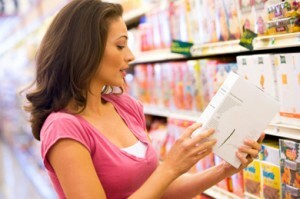 Preservatives help improve shelf-life of products so that products can be sold longer and don’t spoil as fast. Common examples include sodium benzoate, sodium nitrate, sodium nitrite, sulfites, BHA and BHT. Saturated fats oftentimes enhance texture and hold foods together – such as in pie crusts and baked goods. These fats are more resistant to oxidation, making it the preferred shelf-stable replacement for polyunsaturated fats. With the invention of the plant oil hydrogenation process, industrially-produced shortenings have become even cheaper – though this process also generates harmful transfats. Typical examples of saturated fats are palm oil, palm kernel oil, and cotton seed oil. Flavor enhancers such as salt and MSG (aka monosodium glutamate) can overcome weak taste profiles of frozen or fat-free foods. Check the food label for other enhancers such as diglutamates and guanylates. Artificial sweeteners are key ingredients of low-cal foods that substitute table sugar (sucrose) or high-fructose corn syrup with unnatural compounds that taste sweet but aren’t recognized and processed by the body. Saccharin, aspartame (NutraSweet), sucralose (Splenda), and more recently stevia are examples that you may be familiar with. High-fructose corn syrup is added to sweeten virtually all processed foods not designated as low-carb, or low-cal, because of its comparatively low price and favorable properties for blending and transport. Fillers – for example those made from ground corn cobs – increase the portion bulk, making meals look bigger without adding additional expense. The downside is that they don’t add any minerals and vitamins so essential for our bodies. Are processed foods and fast-foods a precursor to disease? When it comes to disease management, many people claim that heredity is to blame. However, many experts point out that lifestyle choices – especially what and how much we eat – plays an important role in the development of many diseases. The main concept behind “Fast Foods” is that they can be mass-produced, and are cheaply, readily and quickly available when you walk into that burger joint or reach for that prepared food in the supermarket isle. In order to deliver on that promise of affordability, food manufacturers have to make certain – as it turns out unhealthy – choices: preservatives, food coloring, saturated fats, flavor enhancers, artificial sweeteners, high-fructose corn syrup, or fillers. All ingredients you would not encounter in a home-cooked meal. In addition to those additives, the second culprit that makes fast foods bad for you is portion size. Most people have gotten accustomed to bigger-sized meals and soft drinks, consuming excessive amounts of calories. By comparison to home-cooked meals, many fast food meals contain way too many calories for their size – in other words, they are calorie-dense foods. After you wolf down that little double-pound burger, your stomach still doesn’t feel full, so you reach for more food. Taken together, there is little doubt that consuming fast foods on a regular basis presents serious health challenges, and makes it so much harder to maintain a stable weight. In addition, the link between a diet high in junk food and high levels of blood sugar has been solidly established. Persistently elevated blood sugar levels will lead to Type 2 diabetes – sometimes called adult onset diabetes – which occurs when the body becomes desensitized to the sugar-regulating hormone insulin. So, what to do if you want to escape the negative consequences of a lifestyle centered around fast foods and processed foods? The most powerful approach is to cook more at home, lowering your exposure to the aforementioned preservatives, food coloring, saturated fats, flavor enhancers, artificial sweeteners, high-fructose corn syrup and fillers. Remember, it’s what you eat that has a powerful impact on your overall health. Vegetables are by far the best foods to protect and promote your health. They have almost all the nutrients our bodies need, and are low in calories, low in fat, as well as low in sugar and sodium. Plus, their fiber content makes them less calorie-dense, so you feel full faster. Organic veggies and fruits are best if they are in your budget. Alternatively, you can opt to wash and or peel non-organics. Local produce is always a good option since it is more likely to be in season and many local farmers use less pesticides than commercial growers. Low fat, high quality proteins that are minimally processed – like skinless chicken breast and turkey – and low-fat fresh diary (like skim milk, yogurt, and cottage cheese). Again, organic is best. Choose whole grains because fiber is your friend. Why? It helps you to feel full, keeps your blood sugar steady, and helps clear and maintain the intestinal tract. Whole grains also have nutrients that “white” processed grains simply don’t have, such as vital minerals and vitamins that are responsible for heart health and many other functions in the body. Homemade meals, prepared with fresh, whole foods that are low in fat and sugar. Is Fast Food a potential risk factor for Alzheimer’s Disease? Get more healthy eating tips from nutritionist Leslie Dantchik. Can liver damage from eating fast food be reversed? Find out why you should be eating whole grains every day.